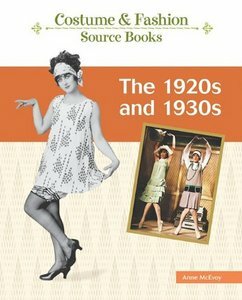 It's not a sewing book, but it's a quick book on the fashions of 1920s and 1930s. I think it pretty much did what it was supposed to do. It's not an extensive history of fashion and it doesn't go into details. What it does, it gives you a good idea of the fashion trends and what to look for when you want to recreate it. Whether you're buying vintage clothes or making your own to achieve the look. 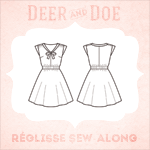 I think it's a great resource for someone who wants to have an period accurate costume or is starting to get into vintage fashion of these decades. It also gives a list of further information, if you're so inclined. But, as I just ordered a more thorough fashion sourcebook and since there's the Great Gatsby Sewing Challenge and all, I thought I would offer this book as a giveaway. It is a pretty little thing, and I think it gives a good idea of the main trends in fashion especially reproducing the look in mind. It talkes about fabrics and cuts and stuff. So, if you are interested in getting this book for yourself, leave a comment by the end of Friday 24th May (Central European time). There are no geographical restrictions, but I will send the book by cheapest method, so it might take awhile. I hope the book finds a loving home.